The process for adding a note is the same from all Notes sections within Broker Brain, whether you are on the Properties>Notes tab or the Notes section of another tab. In some of the sections noted above, the icon to add a New Note will not appear unless there has been activity on that page. For instance, if no MMR's have been completed, there will not be an option to add a note on that screen. 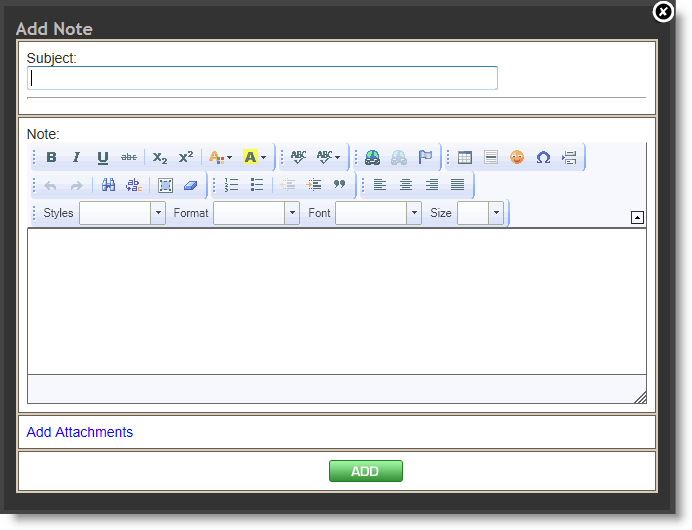 In some instances, such as on the Preservation tab, you have the option to add a note specific to work being done. 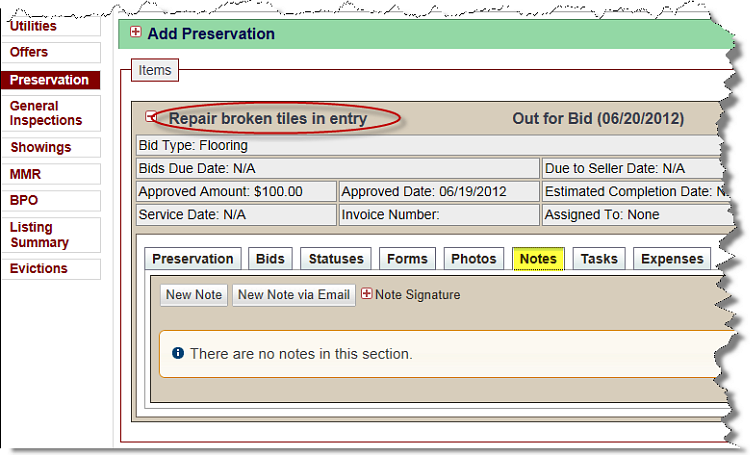 For instance, when you add a new repair bid, you will be able to add a note to that specific repair. You may add as many notes to each item as you like. 1. Open the property on which you wish to add the note. a. If you wish to add a general note to the property, click the Notes sub tab on the left-hand side of the screen. 4. Type the note in the box provided and format as appropriate. 5. If you have a document or a saved email that you would like to attach to the note, click Add Attachments, shown in blue near the bottom of the window; a Browse button will appear. Click to search for the file that you wish to add, and double click it. This should add the attachment and return you to the Add Note screen. (Note: For more detailed information on adding attachments, click here). 6. When you are finished creating the note, click the green Add button. The note, along with any attachments you added, will be added to the property.